Meet iPhone speaker dock that is also a soft toy! The iMini Pet alarm clock speaker features an interactive pet, a frog in this case, which dances along to your music, waving its little froggy arms to the beat of whatever you’re listening to. 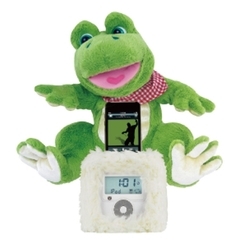 So set the alarm and you can wake up to your music, a dancing frog, and a fully charged iPod. In the fluffy box at the front, there’s a backlit LCD screen for the FM Radio and Alarm clock. Available in two other pets – Max the Lion and Molly the Bear – these pets react to your voice as well as the rhythm of the music that the speakers play. On the technical side: this is a iPod dock with speakers, a radio and an alarm clock, it fits all iPod models and with a line in cable it can connect to any mp3 player with a 3.5mm jack plug. The Alarm setting can trigger your iPod, the radio or a buzzer. Cute. They’re also on the official approved for iPod by Apple list. Super-slim Dell Adamo XPS – new pictures!